MADISON – Governor Walker signed AB 843 into law today at Victor Haen Elementary School in Kaukauna. 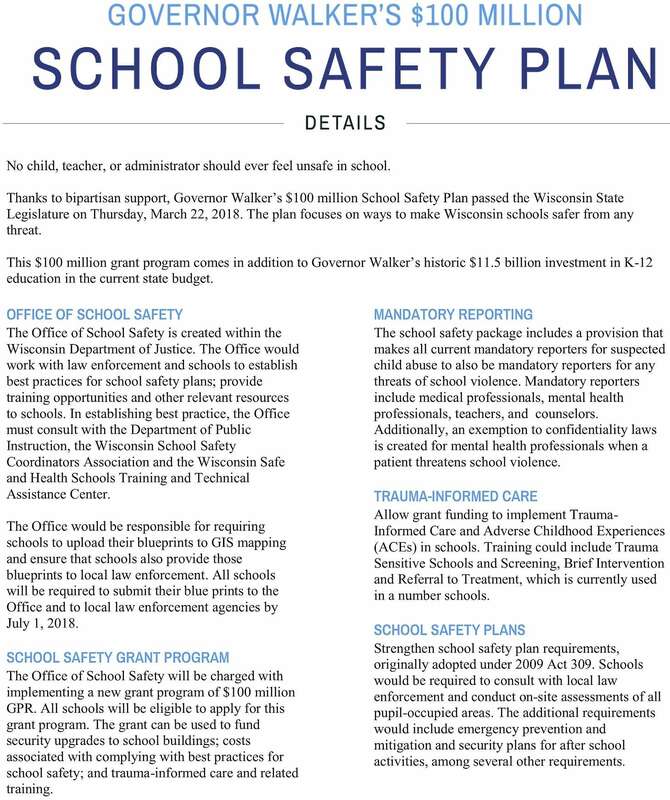 The bill includes Governor Walker’s $100 million School Safety Plan, which creates a grant program for school districts to enhance school safety resources. Every Wisconsin school is eligible for the grant program. Creates an Office of School Safety within the Wisconsin Department of Justice to work with law enforcement and schools to establish best practices for school safety and provide training opportunities and other relevant resources to schools. Provides $100 million to fund a new grant program for security upgrades to school buildings and other eligible costs. Mandates reporting for any threats of school violence. Allows grant funding to implement Trauma-Informed Care and Adverse Childhood Experiences in Schools. Strengthens school safety plan requirements by requiring all schools to consult with local law enforcement and conduct on-site assessments of all pupil occupied areas. Assembly Bill 843 – This bill creates the Office of School Safety within the Department of Justice. Responsibilities for the office include implementing a $100 million grant program for school safety, maintaining blueprints and school safety plans for all schools, and developing model practices of school safety. Additionally, the bill requires mandatory reporting of threats of school violence for certain professions and the integration of trauma-informed care training for school staff. Requirements for school safety plans are strengthened, including adding consultations and site-assessments with local law enforcement. Senator Scott Fitzgerald (R-Juneau) authored the substitute amendment which embodied Governor Walker’s School Safety Plan. The bill passed the Senate on a vote of 28-4 and was concurred in the Assembly on a vote of 78-8. It is Act 143.